CHICAGO (AP) — Manager Joe Maddon and the Chicago Cubs insist they still have plenty left to make another deep run in the postseason. What they don't have is room for error. The Cubs will host the Colorado Rockies in the wild-card game on Tuesday after both teams lost tiebreaker games for their division championships. "We're not dead in the water," Maddon said. The Cubs will send ace Jon Lester (18-6, 3.32 ERA) to the mound, hoping to keep their season going after a 3-1 loss to Milwaukee for the NL Central championship at Wrigley Field on Monday. They'll be back at the old ballpark again, trying to eliminate Colorado after the Rockies dropped a tiebreaker for the NL West to the Los Angeles Dodgers 5-2. Kyle Freeland (17-7, 2.85) starts for the Rockies, and the winner gets Milwaukee in the best-of-five Division Series starting Thursday at Miller Park. Colorado and the Cubs split six games this year, each scoring 33 runs. They haven't faced each other since early May. NL home run champion Nolan Arenado and the Rockies (91-72) had won nine of 10 before getting shut down by rookie Walker Buehler in a 5-2 loss on Monday. Colorado has never won its division. "Excited about it," manager Bud Black said. "It's going to be a great environment tomorrow at Wrigley. Their manager and I go way back. This team enjoys playing on the big stage." Charlie Blackmon, who had two of Colorado's four hits Monday, called it "an amazing opportunity." "The fact of the matter is we have a chance to win the World Series," he added. The Cubs (95-68) reached the playoffs for a franchise-record fourth straight year and had a third consecutive division championship in sight, only to be pushed aside by the surging Brewers. But the Cubs are also a tough team to keep down. They have three straight appearances in the NL Championship Series and a World Series championship in 2016 that ended a 108-year drought. They're no strangers to tight spots and they find themselves in another one, after Milwaukee caught them down the regular-season stretch. The Brewers won four of six against Chicago in September to help forge the tiebreaker game after the Cubs went from trailing them by 4 1/2 games in the division to leading by five. Milwaukee pulled even on the final weekend. 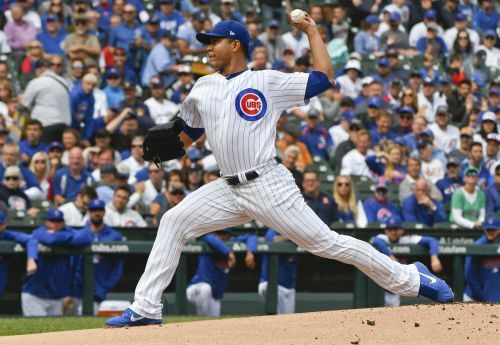 The Cubs then managed just three hits Monday against Jhoulys Chacin and four relievers. They were also held to one run or less for the 39th time even though they ranked fourth in the National League in scoring. "We have another opportunity," Maddon said. "I've been involved with wild card teams that have gone all the way. It happens." Maddon was the Los Angeles Angels' bench coach in 2002 when they won the World Series as a wild card. And the Cubs have certainly won their share of elimination games the past four seasons. They beat Pittsburgh in the wild card-game in 2015 after finishing third in the division behind St. Louis and the Pirates. In 2016, they rallied from 3-1 down in the World Series and won Game 7 at Cleveland to bring home the first championship in 108 years. And they beat Washington in a grueling Division Series last year, winning Game 5 on the road. "This is nothing new to us," outfielder Jason Heyward said. They feel confident with Lester, who will become the first pitcher to start two wild-card games. He gave up six runs to the Royals in 2014 while with Oakland in a 9-8, 12-inning loss. Lester was 6-1 with a 1.71 ERA in his final eight starts. He has been particularly stingy in the postseason throughout his career, going 9-7 with a 2.55 ERA in 25 games and 21 starts. The Cubs endured a long list of injuries and players not performing the way they anticipated, whether it was Yu Darvish making just eight starts after signing a $126 million contract or Kris Bryant making two trips to the disabled list because of inflammation in his left shoulder. Anthony Rizzo got off to a slow start before going on a tear. Willson Contreras slumped after the All-Star break. Nothing has come easily. There were difficulties along the way. And there's some disappointment surrounding them even though they're once again in the postseason. "It's definitely a little different," Rizzo said. "But that whole narrative switches (Tuesday) if we win the ballgame."